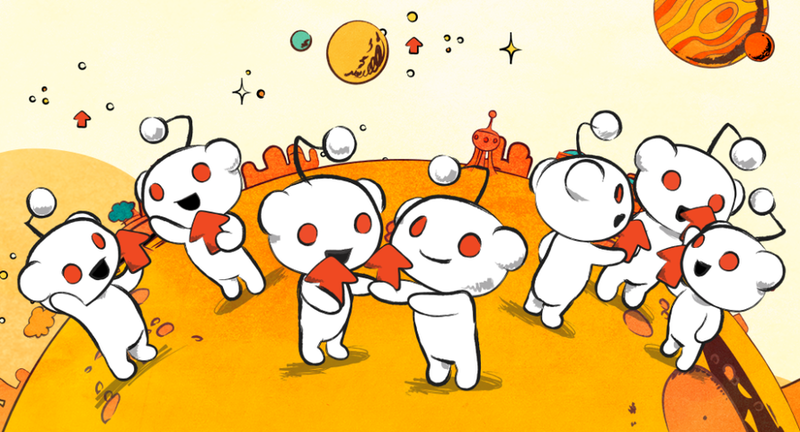 In a time when much of contemporary digital media is forced to downsize amid private "down rounds" and delayed IPOs, due to continued industry headwinds whether as a result of shrinking ad revenues or declining readership, Reddit continues to impress with both its solid growth and unprecedented investor backing. 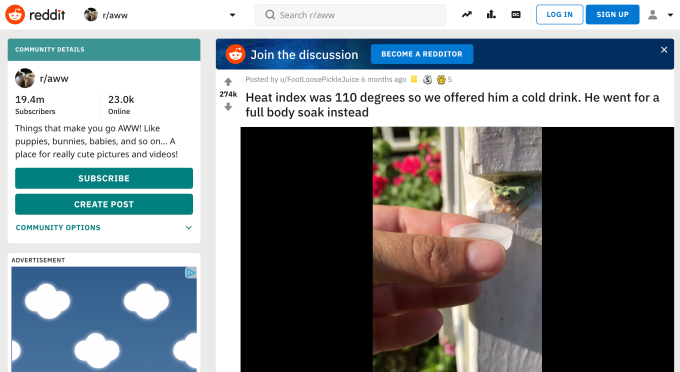 Case in point, TechCrunch reports that Reddit is raising $150 million to $300 million to keep "the front page of the Internet" growing, with the forthcoming Series D round said to be led by Chinese tech giant Tencent at a $2.7 billion pre-money valuation, which depending on how much cash Reddit can round up from other investors, would mean its post-money valuation could hit an epic $3 billion. By reference the market cap of the NYT is not that much higher, at $4.5 billion. The key factor behind this staggering valuation, is Reddit's continued growth, with TechCrucnh reporting that 330 million monthly active users now frequent its 150,000 link-sharing subreddits, most of which are entirely user-created and supervised. That warrants the 50% boost to its valuation, which previously reached $1.8 billion during the company's last capital raise in July 2017 when Reddit raised $200 million. As of then, Reddit’s majority stake was still held by publisher Conde Nast that bought in back in 2006 just a year after the site launched. With Reddit having raised $250 million previously, the new round will give the company a massive, for online media companies, warchest of $400 million to $550 million in total funding, which it can then use to acquire new content or rollup competing businesses. The company's capital raising aspirations were first noticed in December when Reddit announced it had reached 1.4 billion video views per month, up a staggering 40% from just two months earlier after first launching a native video player in August 2017. It also announced to much fanfare that it would start selling cost per click ads in addition to promoted posts, cost per impression, and video ads. A 22 percent increase in engagement and 30% rise in total view in 2018 pushed it past $100 million in revenue for the year, CNBC reported. That said, supporting and moderating all that content isn’t cheap with TC reporting that the company had 350 employees just under a year ago, and is headquartered in pricey San Francisco — though in one of its cheaper but troubled neighborhoods. As noted above, China's tech giant Tencent will be the anchor investors, kicking in the first $150 million of the D round. The Chinese conglomerate owns China's most popular messaging app WeChat and is the biggest gaming company in the world thanks to ownership of League Of Legends and stakes in Clash Of Clans-maker Supercell and Fortnite developer Epic. Yet even Tencent has seen its growth moderate in recent months, mostly due to China’s crackdown on gaming addiction has hammered Tencent’s valuation while Chinese competitor Bytedance’s news reader app Toutiao has grown enormous. Those facts make investing in American news board Reddit a savvy diversification, according to TechCrunch, even if Reddit isn’t accessible in China. In addition to the $150MM Tencent investment, Reddit could see legacy investors fill out the round with up to $150 million in additional cash from previous investors like Sequoia, Andreessen Horowitz, Y Combinator, or YC’s president Sam Altman. They could see potential in one of the web’s most unique and internet-native content communities. Reddit is where the real world is hashed out and laughed about by a tech savvy audience that often produces memes that cross over into mainstream culture. And with all those amateur curators toiling away for Internet points, casual users are flocking in for an edgier look at what will be the center of attention tomorrow. While Reddit has avoided much of the backlash hitting fellow social site Facebook, in the past, the anonymous site has had plenty of problems with racist, mysoginistic, and homophobic content. In 2015 it implemented quarantines and shut down some of the most offensive Subreddits. But harassment by users contributed to the departure of CEO Ellen Pao, who was replaced by Steve Huffman, Reddit’s co-founder. Huffman allegedly went on to abuse that power, secretly editing some user comments on Reddit to frame them for insulting the heads of their own Subreddits. He escaped the debacle with a slap on the wrist and an apology, claiming "I spent my formative years as a young troll on the Internet."